Have you caught your breath and recovered from the jaw-dropping 100th episode of NCIS: Los Angeles? I'm not sure how they fit so much physical and emotional turmoil into one hour. "Reznikov, N." started with a cut off finger, a bloody threat on the wall and a kidnapping that led to gun fights, car crashes, explosions, shootings and death. Each new answer that Callen finds out about his family and past comes at an extreme cost and leads to more questions. His perseverance is noteworthy. Despite all that he's been through, he's survived and continues to heal his broken soul. In res media is a storytelling style that's increased in popularity over the last few years and become overused on television. Most stories are not improved when the viewer is shown the middle or end first. In NCIS: LA's 100th episode it was used it to great effect. If the episode would have begun with the antics of the team at the climbing wall, the serious and personal tone of the case wouldn't have been properly established. The extreme contrast of seeing Granger shot, Sam in a burning car, and then Callen meeting his father and watching him shot with the six hours earlier jump to the fun and laughs was enormous. It was emotional whiplash and compelling. Chris O'Donnell was superb in his performance from beginning to the heartbreaking final moments. Callen's been through more than any person should in his life. Here's a man who doesn't know his own first name and then finds out that his father is alive, had his finger cut off, and kidnapped. That's worse than creating a wound with acid and adding salt to it. Hetty tried to protect him by keeping him out of the case, but Callen's too perceptive to keep away. Whether she was right or wrong to keep the truth from him, she did it more from a genuine place of concern and affection than integrity of the investigation. Why get his hopes up or destroyed before they even knew if the man was his father. I was impressed that Callen kept it together when he found the box of photos in the closet. He was affected by it, but he kept his head on and moved forward. It was proof that the man had some connection to Callen and suggested that he could be his father. From there, Callen had to go on his own. It's in his nature to be a lone wolf. He's integrated himself successfully into the boathouse crew, but this was personal. The Comescu family was once again out to destroy him. There were quite a few callbacks to previous Callen-centric episodes. It was finally revealed who was keeping tabs on him and took the photo of him in the cemetery. 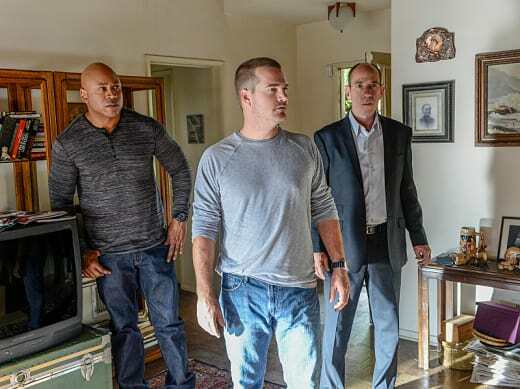 Callen turned to Arkady for help which was fortuitous since he had a connection to Michael Reinhardt and he was the link Comescu was going to use to find Callen. Whenever Arkady is involved, it's going to be entertaining. His involvement lightened the situation just enough without taking away from the intensity. Now that both Hetty and Callen owe Arkady, it probably won't be long until he reappears. In the end, Michael Reinhardt wasn't Callen's father, but he sacrificed himself just like a father would. Before he died, Michael gave Callen the gift of information about his real father -- his name. Nikita Alexander Reznikov. Callen's father was a KGB General who helped Michael Reinhardt escape when he was an East German refugee named Hans Schreiber. While Callen has more information about his father, there is much still he doesn't know. Is he still alive? And, if not what happened to him after being imprisoned in Siberia? A chapter of Callen's story was completed, but there are many more to tell, including what the "G" stands for. Creator Shane Brennan said in an interview this week, that the meaning of "G" will be revealed. The final few minutes of the episode were filled with both joy and sorrow for Callen. The film of Callen on the swings with his father was poignant. While it gave Callen a piece of his father, it was also a reminder of all that he missed out on as a foster kid. "My family" indeed. May Callen one day be reunited with his family and in the meantime continue to embrace the family he's found at the boathouse. Did you enjoy the callbacks to previous episodes? Should Callen search for his father? Or, should he put that aside for now? Will Callen be better for going through this day and getting more information about his family? Permalink: It's bad. It's all bad. Aww, bugger.